I will be giving a presentation at conference about "the canonical" at the Carsten Niebuhr Institute in may 2011. The presentation is in the form of a walk through central Copenhagen. The space of the city has been charged with meaning throughout the centuries. The public space of the capital can be deciphered as a canon of national identity. 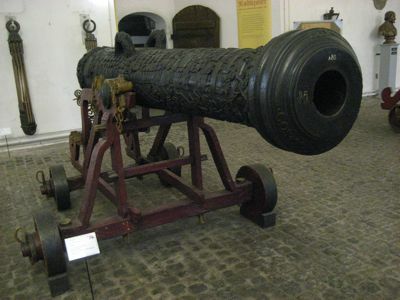 I will be pointing out various canons that co-exist or compete in Copenhagen. To make this analysis, I will be bending and testing the concept of what might constitute a canonical text. The usefulness of the exercise lies in the distinctions I outline below. 1) How is a canon expressed. Does it have to be a text or a list? 2) What os the origin, meaning and function of a canon? a. Who establishes the canon – what is their authority? Is it an existing group with an established spiritual or cultural authority? Is it an appointed body? In the case of the city, it’s canon emerges over several generations. - - i. Ideal. The canon expresses a higher purpose. Divine will, or platonic archetypes. - - ii. Edifying (opbyggelig). The canon sets up standards we can aspire to fulfill. - - iii. Negotiated. The canon becomes a defining point for cultural cohesion; of a compromise. d. Are the canonised ”objects” sublime expressions or representative of desirable ideals? 3) What is the subject matter of the canon? 4) How do canons co-exist? a. There are separate canons of architecture, history, art etc. b. National canon can be challenged by a canon with another intention, fx. a national canon can be challenged by one with a broader focus. The ”Canon of Copenhagen” can be challenged by a canonical ”must see” lists from guide books. c. How do various touristic canons compare? Conflict can arise over the symbolic value of the city. 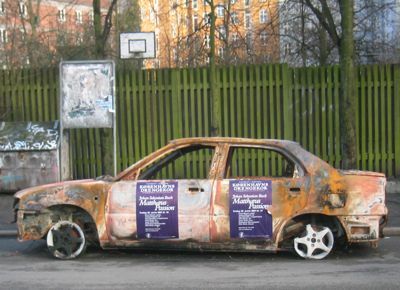 In march 2007, the alternative culture bastion Ungdomshuset in Nørrebro was cleared and razed. Widespread rioting took place in the Nørrebro neighborhood, and around Christiania. Many cars were burned. This photo of a torched car is from March 8, 2007, a week after the event. Posters have been put on the wreck advertising the Copenhagen Boy's Choir performance of Bach's Matthäuspassion. Incidentially that's 4 years ago today, the same day as the picture was taken of the gun from Tøjhusmuseet, the Army museum. Also incidentially March 8 is the International Womens' Day which was first suggested in the future Ungdomshus. But that fact did not protect the building in this century. Currently a battle of symbols is taking place around Christiania, the self declared Free City on the ramparts area of Copenhagen. Some people consider Christiania to be a canonical site - others deem it to be an abomination.